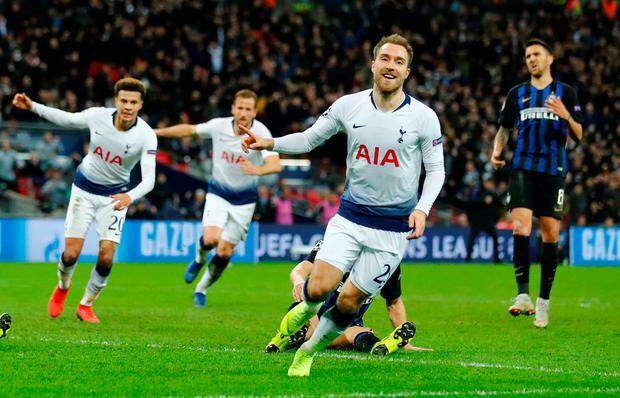 Christian Eriksen ensured Tottenham's bid to reach the Champions League knockout stages will go to the final group game after the Dane secured a late 1-0 win over Inter Milan at Wembley. They are still outsiders to progress, however, and they will have to produce one of the most famous nights in the club's history if they want to do it, as they have go to group winners Barcelona in a fortnight and match the result of Inter, who play at home to PSV Eindhoven. Given the critical nature of Tottenham's predicament, it was little surprise they dominated and they should have been awarded an early penalty when Lucas Moura was barged over by Matteo Politano. The frustration levels increased after the break as Inter did everything to disrupt the game and Spurs had no fluency whatsoever. Inter did threaten on the break as Ivan Perisic brought a fine save out of Hugo Lloris, but Spurs' golden moment came with 10 minutes remaining and it was a brilliant goal. There was a nervy ending as a 1-0 win meant Spurs had the better head-to-head record and Inter pressed for an equaliser, with Lloris producing a smart save to deny Danilo D'Ambrosio.